When it comes to design, the Italians know how to get it right. From high fashion and fast cars to lavish jewels and striking watches, there’s something to be said for the Italian take on design. Typically bold, imaginative, and expertly crafted, objects that flaunt Italian flair never shy away from standing out. So what happens when the famed Italian carmaker, Ferrari, and the luxury watch brand born in Italy, Panerai, team up? The head-turning Panerai Ferrari Granturismo Rattrapante watch. Let’s dig in. 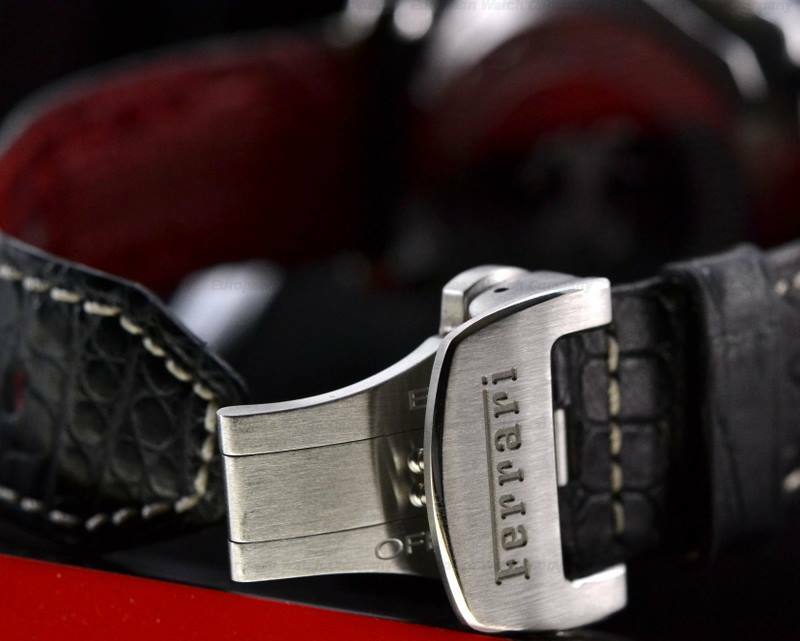 The partnership between Ferrari and Panerai began in the mid-2000s when the duo unveiled the Ferrari Engineered by Officine Panerai collection. Although it was short-lived, coming to an end about five years later, the relationship did create a handful of gorgeous watches. The Ferrari Engineered by Officine Panerai collection was divided into several lines including Scuderia, Granturismo, and special editions. Part of the appeal of the Panerai Ferrari watches is that they were produced in limited quantities, therefore there aren’t that many in the market. A particularly attractive model that came out of the partnership is this Panerai Ferrari Granturismo Rattrapante FER00005 we see here. Sporting a generous 45mm stainless steel cushioned-shaped case, the shape of the case is unmistakably Panerai while still different from its Luminor and Radiomir counterparts. There are Ferrari inspirations throughout the Panerai watch. 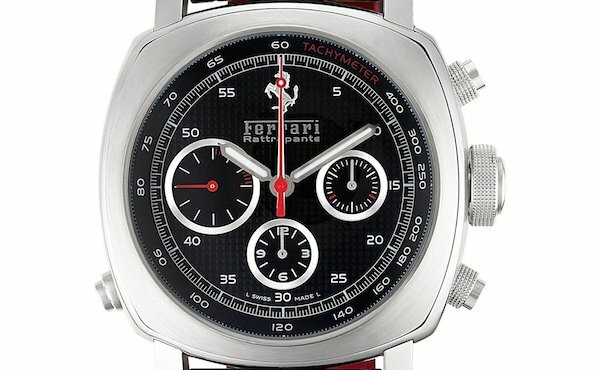 The dial of the Panerai Ferrari Granturismo Rattrapante features a speedometer-like design, especially on the three registers at 3, 6, and 9 o’clock. 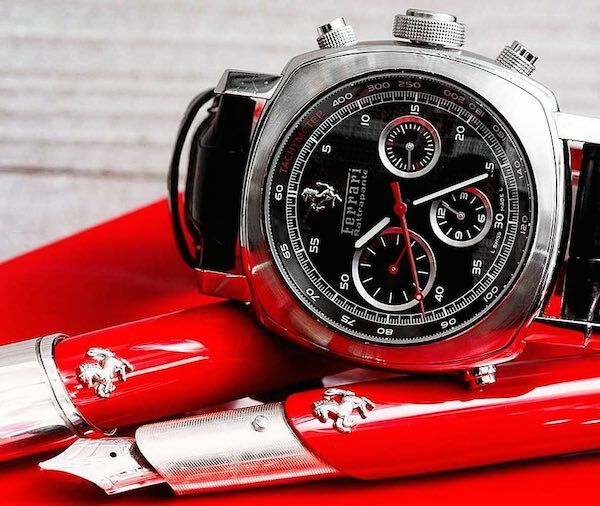 Of course, there are flashes of crimson all over the dark dial–Ferrari’s favorite color. Complementing the chronograph functionality of the watch is the tachymeter scale running the periphery of the dial, allowing wearers to measure average speeds of racing cars. The black dial has a beautiful hobnail design, adding more depth to the face of the watch, while sitting proudly at 12 o’clock is Ferrari’s famous prancing horse. The chronograph pushers and winding crown that protrude from the right hand of the case also have a touch of motorsport spirit with a textured finish that resembles car tires. As its name suggests, the Panerai Ferrari Granturismo Rattrapante is not a standard chronograph but rather, a rattrapante, which is French for a split-seconds chronograph. That means the user can time two simultaneous events using the pusher located on the bottom left-hand corner of the case. Through the sapphire caseback we can see the automatic movement powering the watch. 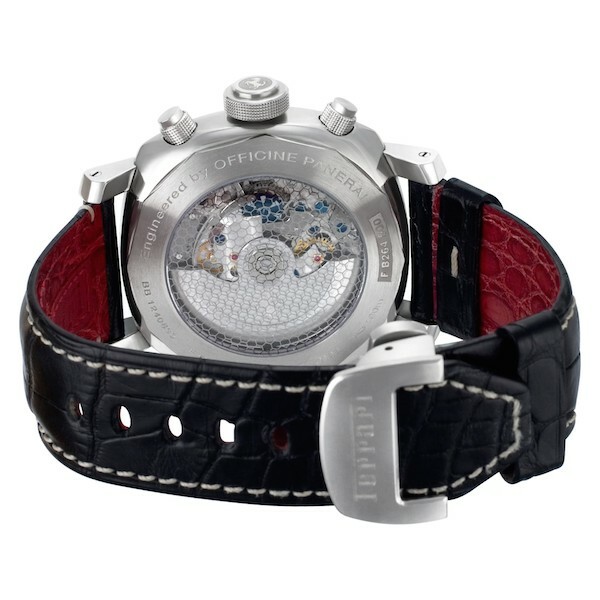 The Panerai Ferrari Granturismo Rattrapante offers a 42-hour power reserve. Finishing off the look of the watch is an attractive black alligator strap with a steel deployant clasp, complete with a FERRARI engraving. 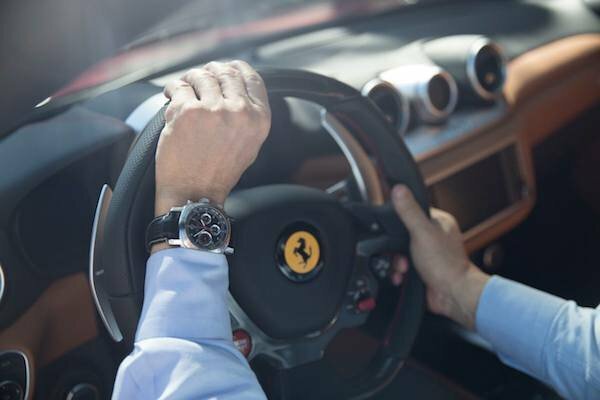 While relationships between carmakers and watchmakers are not uncommon, there are some spawn better watches than others and the Panerai Ferrari Granturismo Rattrapante is certainly one of them. Blending a respect for high performing cars, high-end watchmaking, and Italian design, the Panerai Ferrari Granturismo Rattrapante is a great watch for someone who loves automobiles and timepieces. 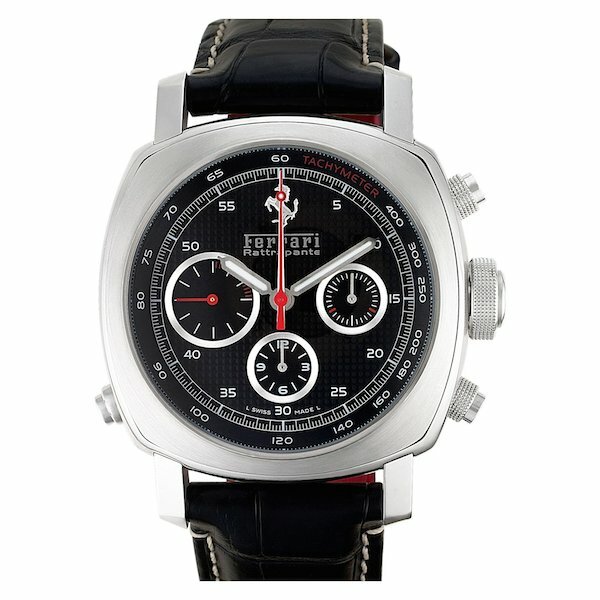 Both brands belong to Rchemont Group and as a watch collector I cannot see me buying any new watches produced by them. RG destroyed two iconic brands they own ( Panerai and IWC) by overproducing pieces that came with all sorts of problems and defects with a horrible post sales services. I love the classic Mont Blanc pens but I cannot see me ever buying a watch produced by them.